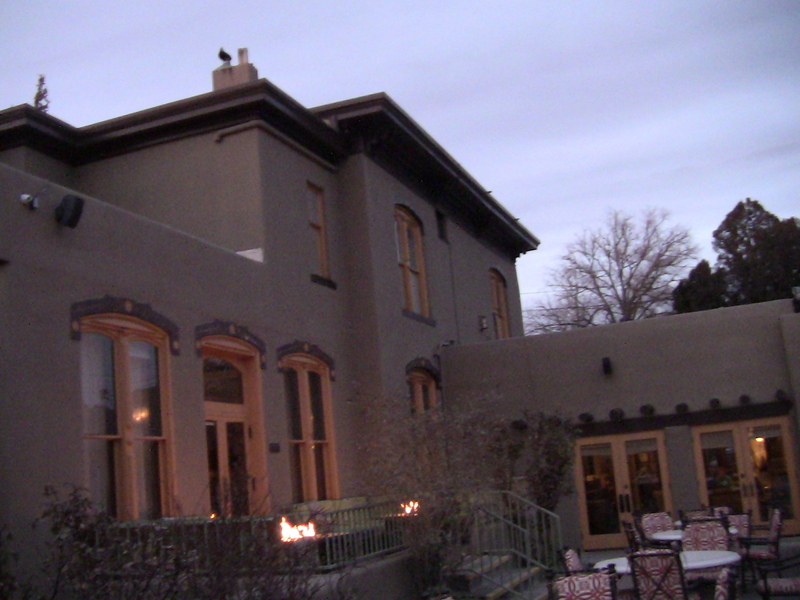 BELOW: The haunted and historic LA POSADA ---- forget what the NAY SAYERS write or say --- this place is haunted. During Wild West & Turn of the Century days, the master of the manner -- was ABRAHAM STAAB -- he was the AL CAPONE of the New Mexico Territory. 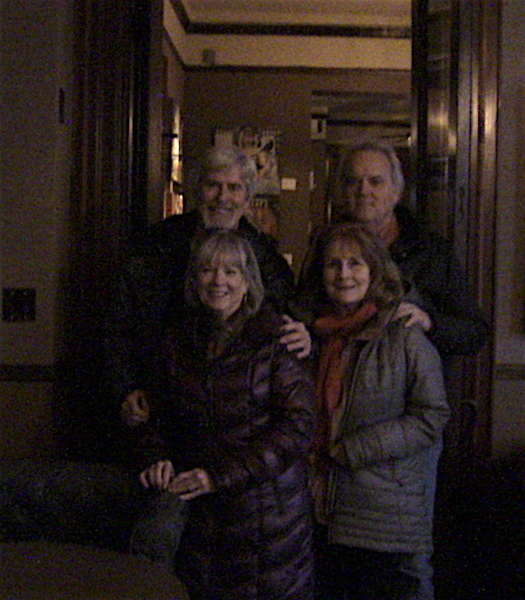 The second floor is where Julia was imprisoned by her husband for five years -- she was dispatched -- depending on the tale -- in the room behind the far right or middle window. Through the centuries, Julia's ghost has been at the windows. 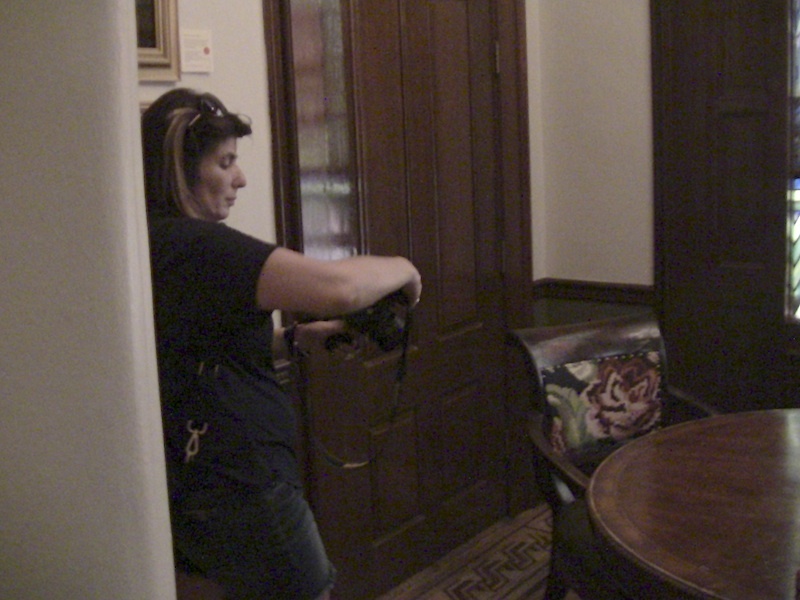 The below picture does capture an ominous look or odd vibe of the mansion. 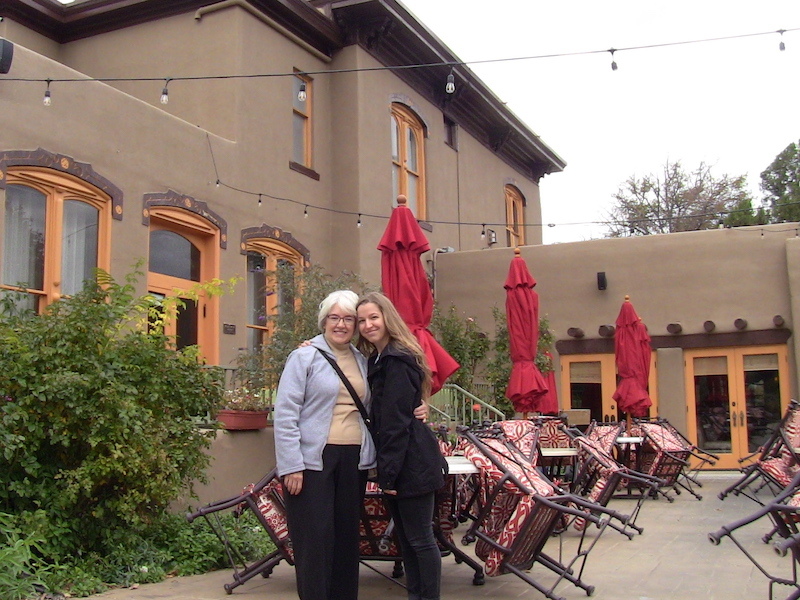 BELOW: AUTUMN TOUR: AT the La Posada Resort, this patio area where these two ladies are standing --up until 1995 used to be Julia's ROSE GARDEN. The eccentric minded had the manicured area labeled, "the GARDEN OF GOOD AND EVIL" ... YES -- the ghost of Julia would look down from her prison rooms at her garden below. BELOW: On tour with Allan, these two ladies saw the ghost of Julia peering down onto the patio area which used to be the garden area... The lady on the right was the first to see the shade. The sighting was quite dramatic, the witness left Allan's tour and sprinted to this spot, she could not believe what she had just seen. 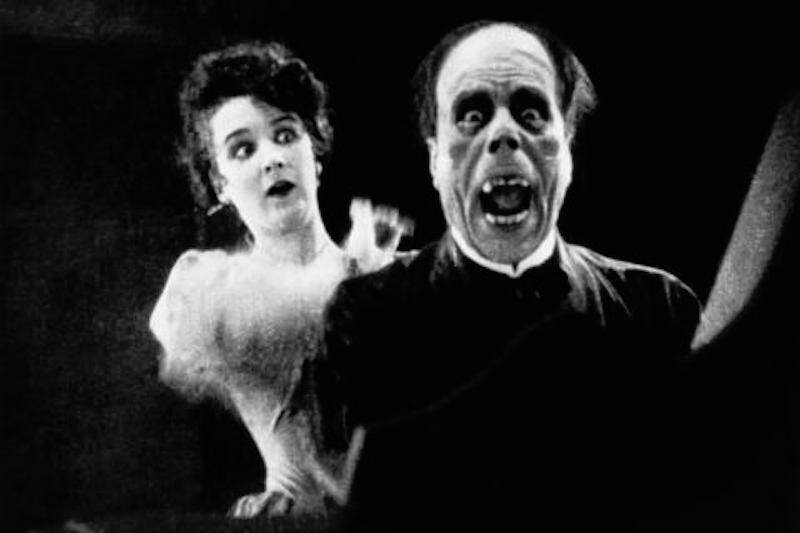 The other lady joined and saw a glimpse of the ghost before it disappeared. Unfortunately Allan was late to the scene and only got aftermath photos. 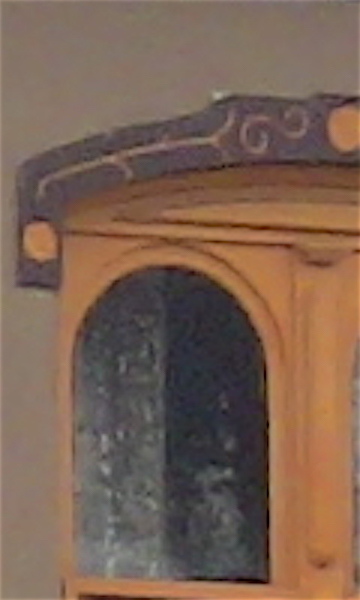 Below: The window where the ghost of Julia was spotted. It is rare but now and then in the room beyond the window, Julia's ghost is seen. Likewise in the room and hallway beyond this window, Julia's energy at times has run amok. 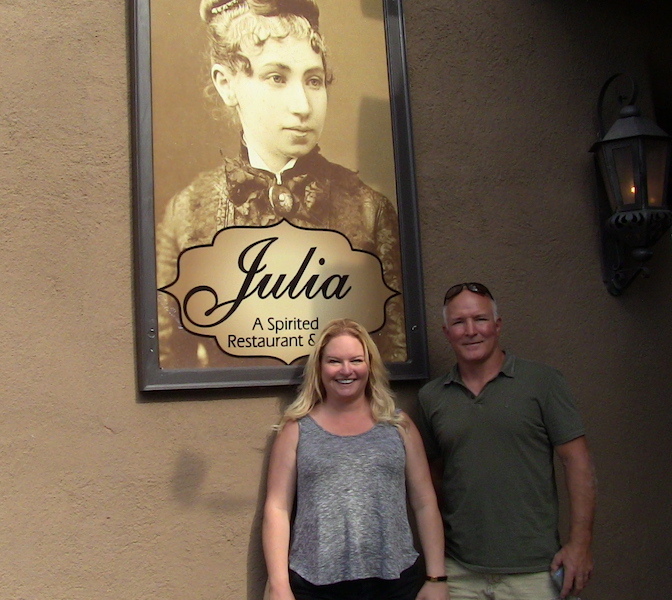 Above and below -- through the decades, different placards --- welcoming guests to Julia's restaurant. Her mansion is a SPIRITED PLACE! 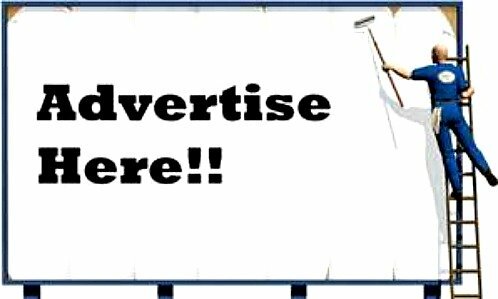 Note the above two photos with the pictures of JULIA at the front entrance advertisement, then compare the Juila sign with the photo below. The question, is Julia peaking from a window or what is seen is the result of a strange light effect? Behind these two ladies is the ghost rooms, the JULIA STAAB SUITE --- this doorway opens to the middle window in the picture at the top of this page. 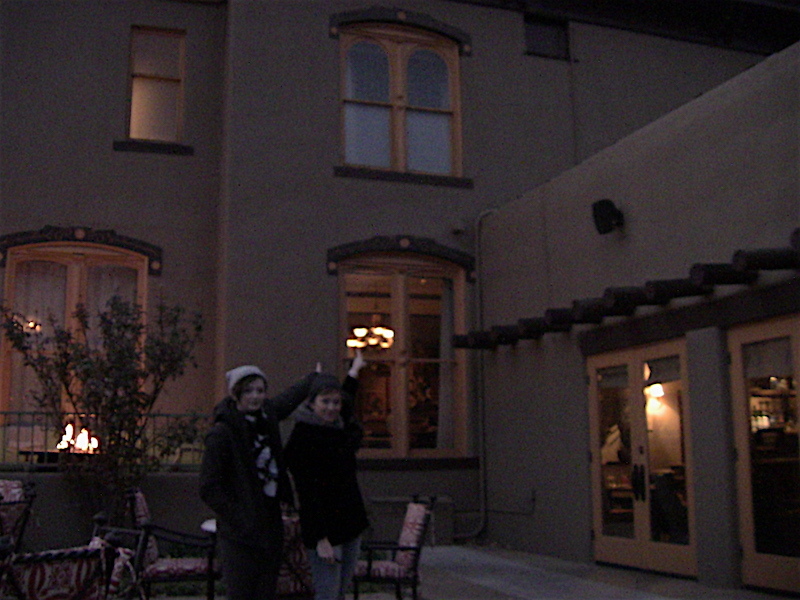 BELOW: An ancient picture of ALLAN upstairs IN THE HAUNTED MAIN BUILDING of La Posada. 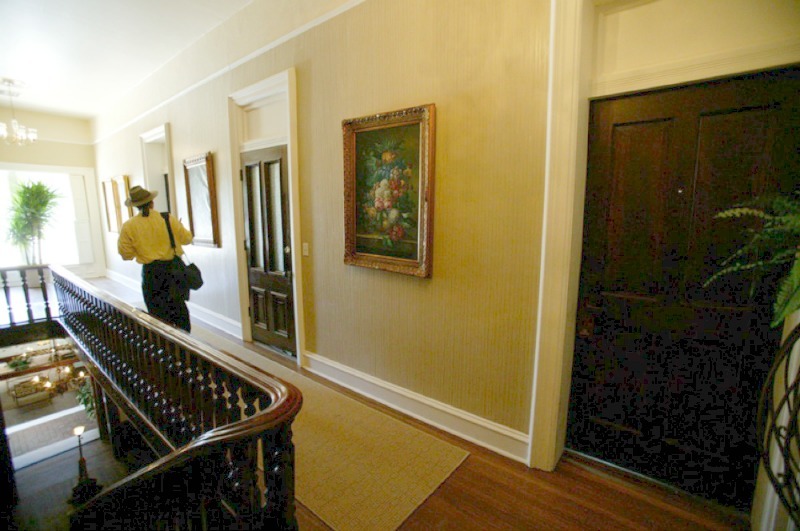 To the right of Allan are the rooms where Julia was jailed, there is activity at times at the doors and at the far window in the hallway. Supposedly, Julia tried to escape from her imprisonment at the far window that is in front of Tour Guide & Author -- ALLAN. Note how old this picture is, there is no plaque commemorating this room "THE JULIA STAAB SUITE". 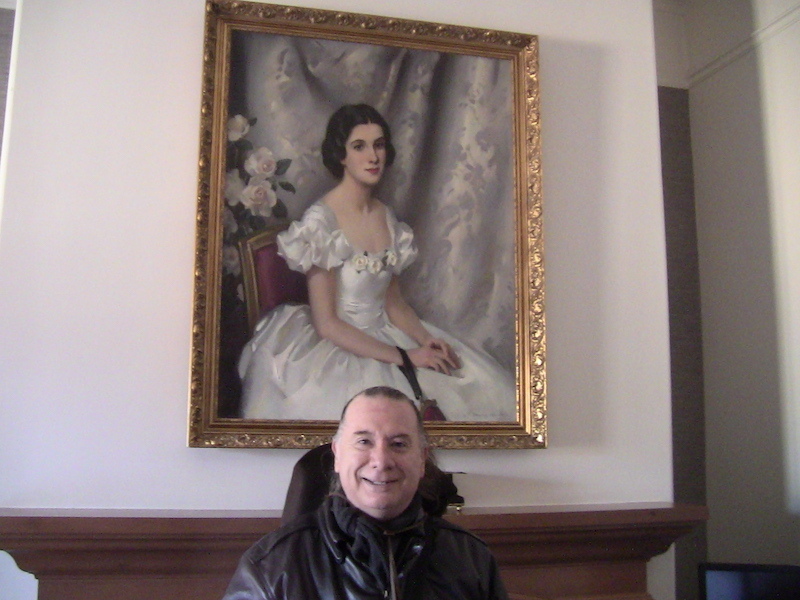 Below: Allan Pacheco -- your tour guide -- in front of the portrait of JULIA 2018-- ( A Controversial Picture) it is in an ew place as compared to the photo below this one. Above and below -- can not account for the difference in the light and look of Allan -- picture taken minutes apart -- Al by himself then next to Malibu. Did Allan get zapped by a now terse JULIA? Who knows? 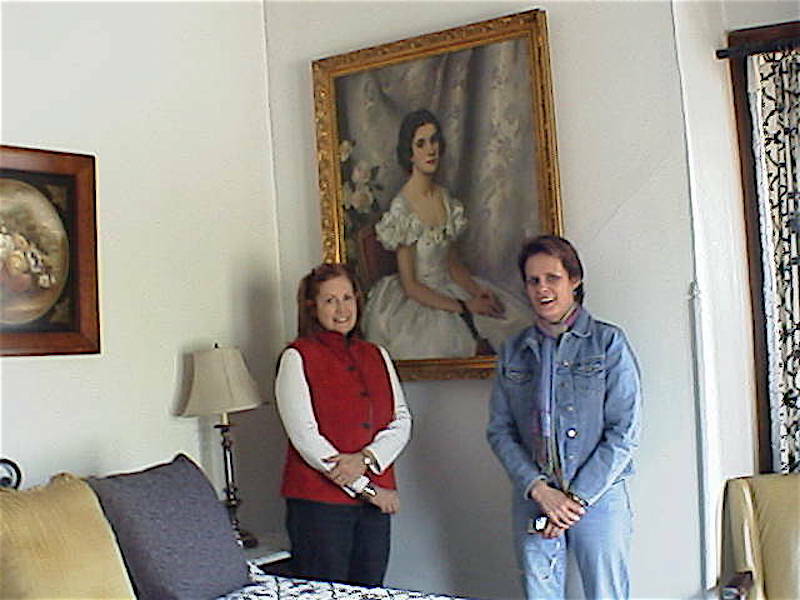 BELOW: MARY LOU & NANCY in the haunted Staab Suite --- this is where the mayhem happened --- as in Julia was dispatched. 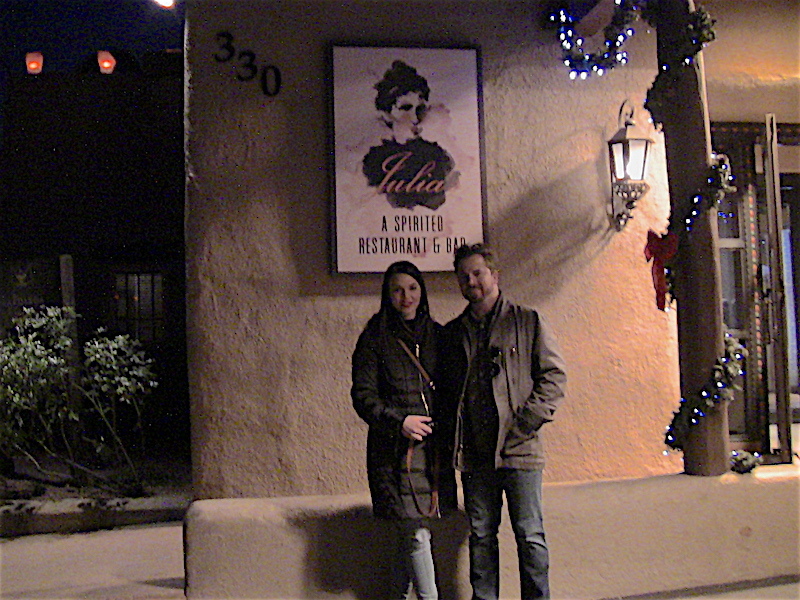 The management of La Posada told ALLAN and firmly, that the portrait in the murder room is that of Julia as a mature woman. 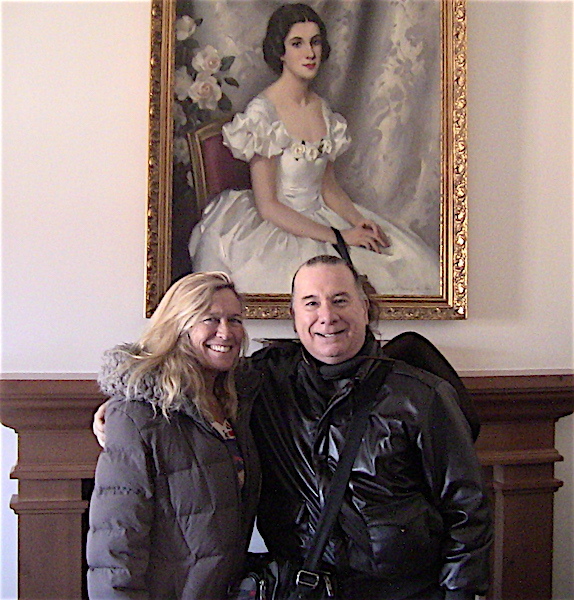 The honchos at La Posada should know, but Allan had a different theory on the portrait. 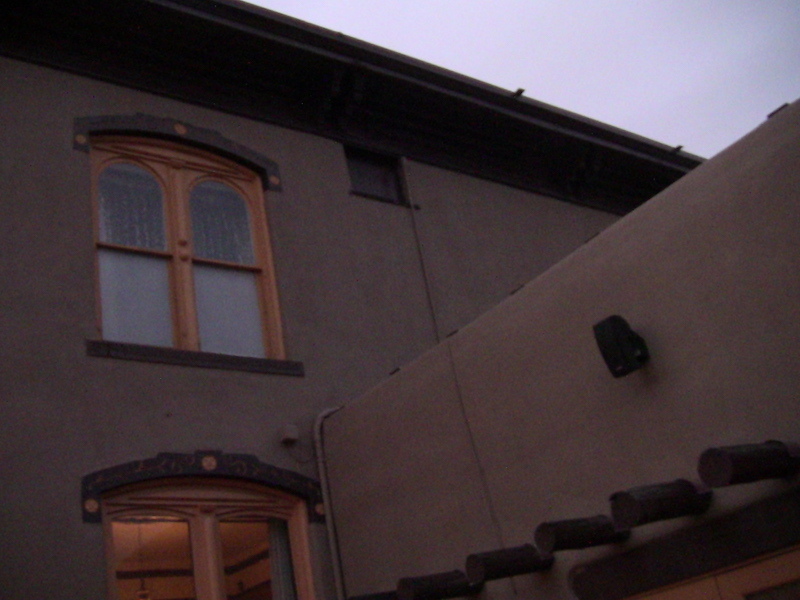 Below snippet from a La Posada bartender, another version of why Julia haunts her old Mansion. Below, inside La Posada at the end of a tour --- shadow chasing with a camera. 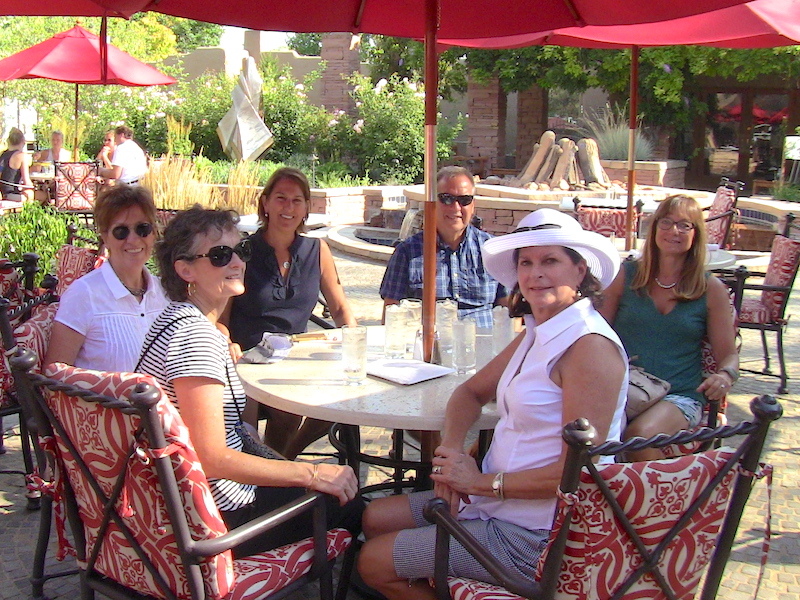 Below: End of a tour at LA POSADA --- in a place that is not so scary --- however -- at one time this patio prior to 1996 was a large ROSE GARDEN -- Julia Staab's ---- before the hedges of roses were taken out and this patio put in its place --- this location was known by the eccentrics as the GARDEN OF GOOD AND EVIL -- and yes on rare occasion at t night Julia's ghost was seen in her ALICE THROUGH THE LOOKIG GLASS garden... Not any more -- it is a concrete patio with bright colors and a great place to end a daytime tour at.